-	the deferent is the main cycle of apparent planetary orbit, as measured from the Earth. The name derives from the Latin de ferre 'to carry' or 'bear away'. The 'Ptolemaic theory' assumes that whilst the luminaries move in direct motion around the Earth, other planets 'circle' around their orbital path, known as the 'deferent' or 'eccentric'. 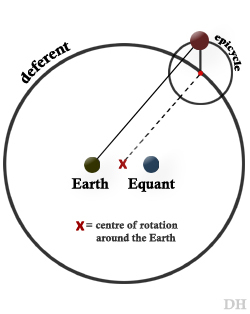 The centre of the deferent is not aligned to the Earth, but to a point midway between the Earth and an assumed balancing point called the equant. This displacement from the Earth's centre causes alterations in the proximity of the planets to the Earth, which creates the apparent changes of planetary speed and motion.